Beneath the flour-covered counters, latte-holding hands, and DSLR camera, is a stay-at-home-mom with many of the same day in and day out joys and challenges as you. 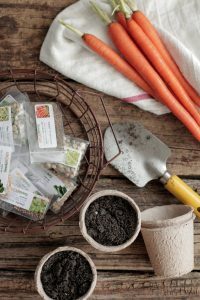 Yes, this blog is about food and cocoa powder foundation (which is technically food, just for your face), but here’s the thing about real food and natural living: this lifestyle requires time and organization. A natural and real lifestyle is about more than just food and homemade lotion…it‘s about being organized in every area of life. Now, I’m not talking about a perfect house. Oh no, trust me! I’m not an expert in keeping a “perfect” home. Do those even exist outside of Country Living and Martha Stewart? 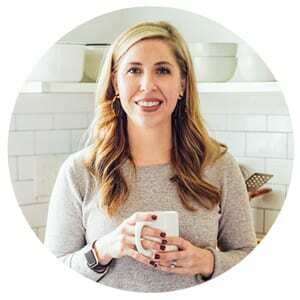 Please just say, “No.” What I am talking about is simple organization that helps create more time in our lives for preparing food, enjoying meals together, and enjoying our family. When life is disorganized and frazzled; food, life, and natural living don’t run smoothly and cause more stress, which is just the opposite of health. You know one of the motivations for going “real”…health! I think you get the point. Setting up routines and creating organization makes this life of “real” and “simple”, well….doable and simple! A couple of weeks ago, I shared a new morning routine I created for the kids (okay, it’s really more for me, but the kids use it too) to help our mornings run smoothly. Happy mommy= a great day! Mornings have been running smoothly and organized! The family is fed healthy meals, the dishes are cleaned, the chickens aren’t stinky, and morning hugs are enjoyed. 8:00 pm: Bath-Time: Sometimes I add sleepy-time bath salts or homemade sleepy-time body wash.
8:20 pm: Brush Teeth: My kids use homemade toothpaste. 8:25 pm: Quiet Play: The kids play in Piper’s room with their train table or look at books. 8:35 pm: Read Book: Dustin and I read books with the kids. 8:50 pm: Good-Night Hugs: The best part of the night! 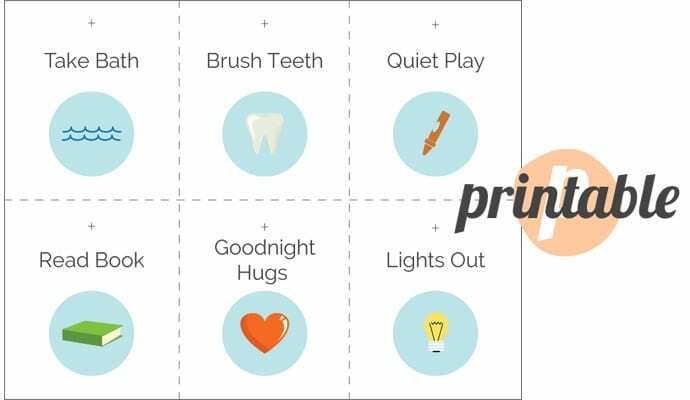 We don’t abide by this exact timing, but knowing how long each activity should last helps prepare the kids for our predictable bedtime routine. 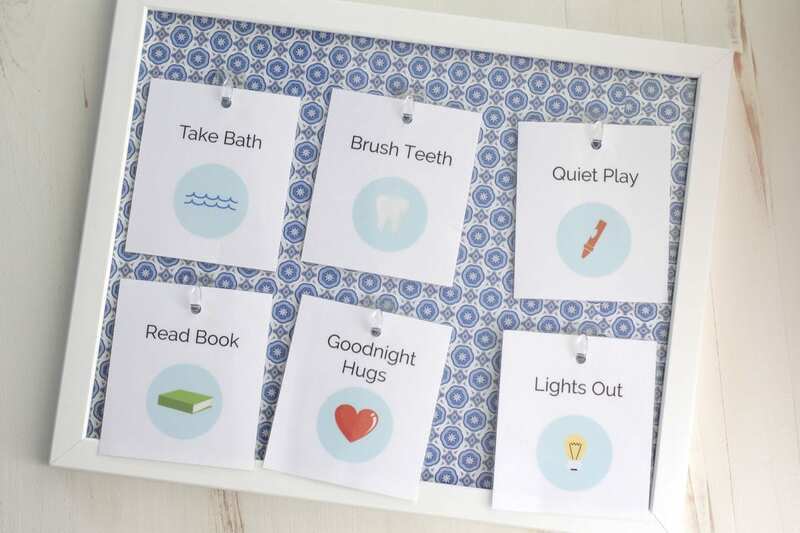 The most important part of creating a bedtime routine (or morning routine) is establishing clear expectations and sticking to them! 1. Brainstorm: On a quiet evening, after the kids went to bed, I sat down and brainstormed a few tasks which I wanted to accomplish at bedtime. 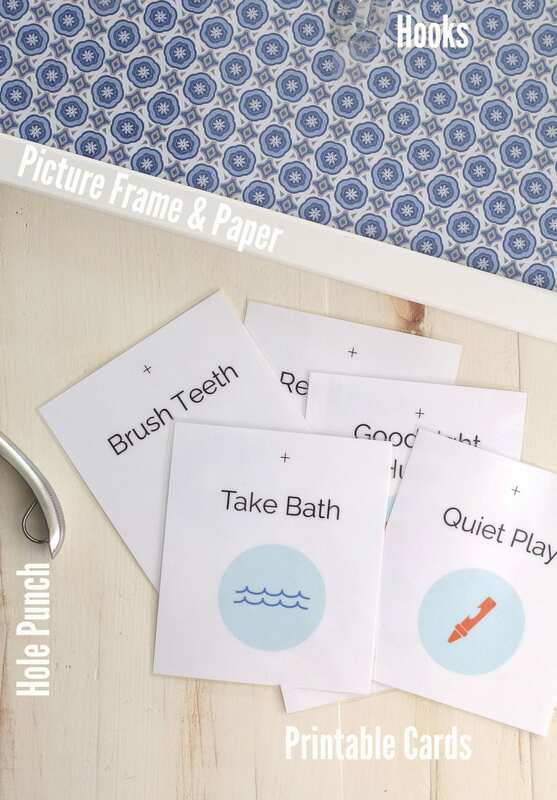 To break down the tasks in a kid-friendly way, I created a card for each task. 2. Family PowWow: I called a short meeting with the family. Dustin and I shared each routine card with the kids and talked about each task. We talked about why each task was important. 3. 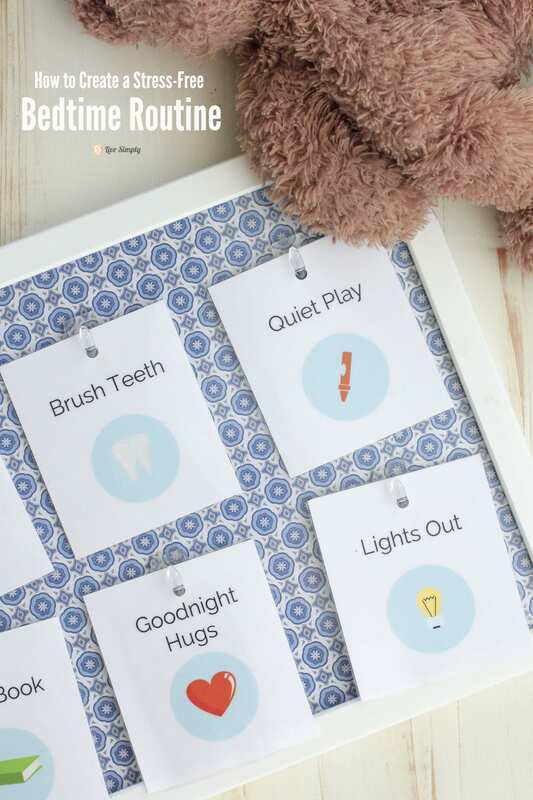 Test Run: I created a board for the bedtime cards with hooks, so each card could easily flip over once the task is completed. For one week the kids and I practiced each task. Print the bedtime cards on card stock or printer paper. Laminate if desired. Punch a whole in each card. 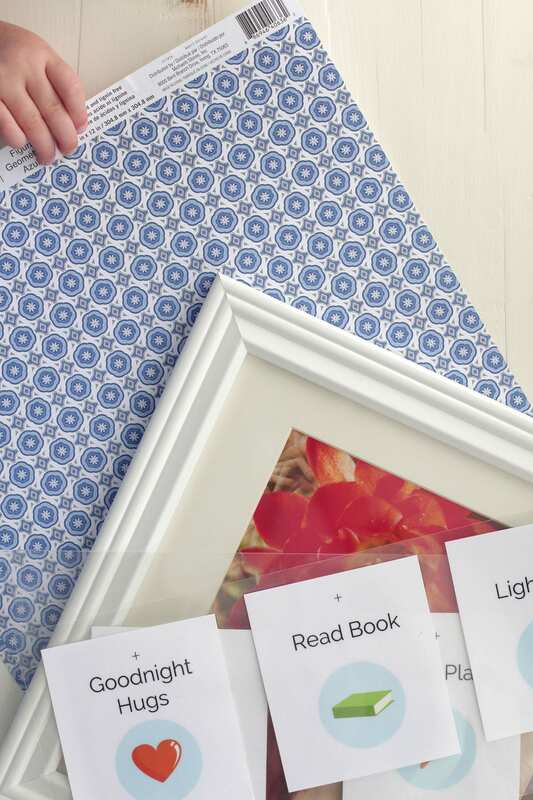 Place the scrap book paper in the picture frame. Secure the paper in the frame. Peel and stick the hooks on the glass of the frame. 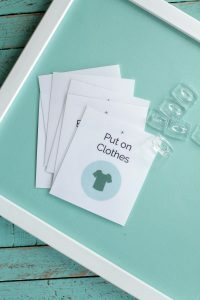 Place one card on each hook. 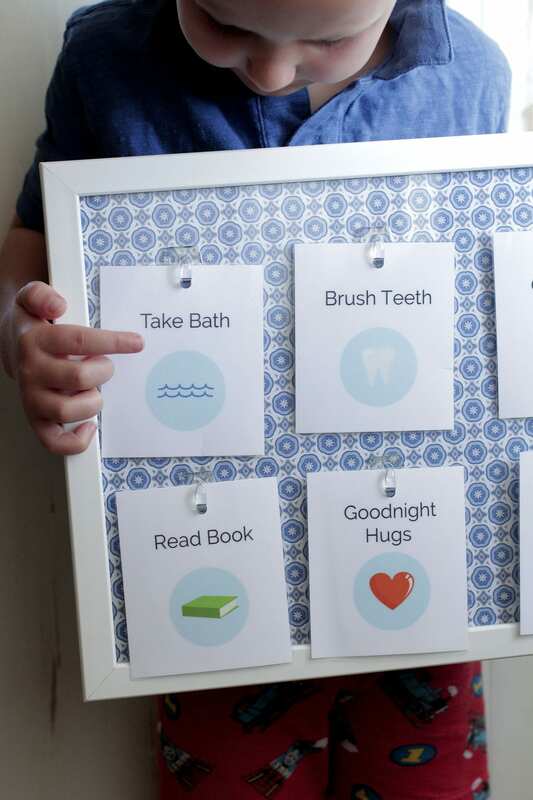 After your child completes each task, ask him/her to flip the card as a sign that the task has been completed. 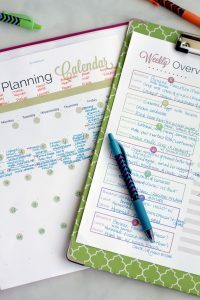 With more organization in place, just think of all you’ll be able to accomplish! Or maybe just enjoy a few extra minutes of quiet time with a homemade latte. Very interesting post. I have been looking for a bed time chart and stumbled upon your idea. Out of curiosity, what type/size frame did you use? Hey Claudia, I believe it’s an 8×10 frame. I’m currently traveling, but can check when I get home. Thank you for your post and printable cards!